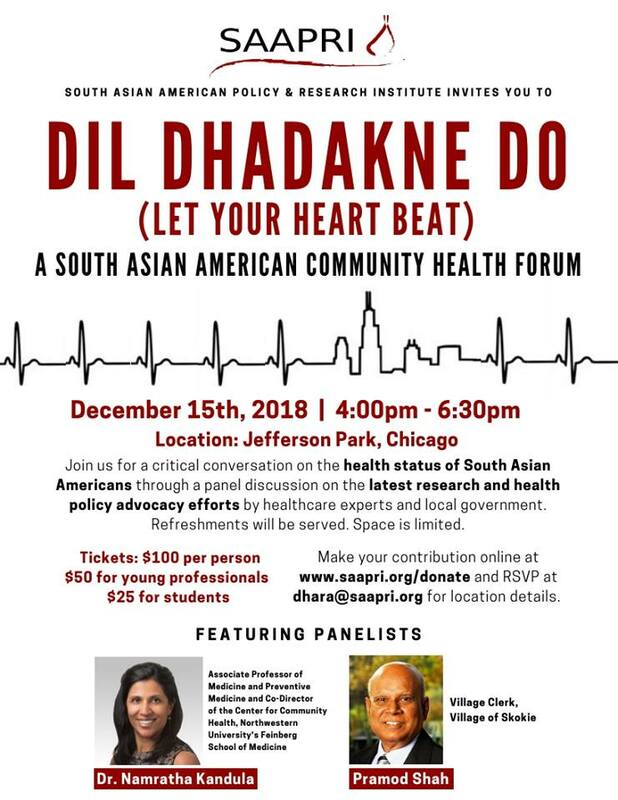 Join SAAPRI for Dil Dhadakne Do: A South Asian Community Health Forum for a critical conversation on the health status of South Asian Americans. South Asians living in the United States are disproportionately at risk for heart disease. We are 4x more likely to have a heart attack than the general public, experience heart attacks at an average of 10 years earlier, and have 50% higher mortality rate than any other ethnic group. The event will feature a panel discussion with Dr. Namratha Kandula from Northwestern University’s Feinberg School of Medicine, and Village Clerk of Skokie Pramodh Shah. We will discuss the latest research and health policy advocacy efforts by healthcare experts and local government, as well as how our community can work together to build on SAAPRI’s efforts to help pass H.R. 3592: The South Asian Heart Health Research and Awareness Act. RSVP today!